Is recycling in Japan a sham? For all the trouble we go through separating plastics at home for recycling, where does it all go? This video will show you what is really happening to the plastic in Japan. A far cry from this post I wrote in 2006. This entry was posted in sustainability and tagged japan, recycling, unsustainability on 13 September 2018 by signature103. Children draw conclusions from what they can see. I remember asking myself I was young where did ham come from, and not being able to give an answer. Processed food look so far removed from what they are made from that it is impossible to deduce what it is simply by looking at it. 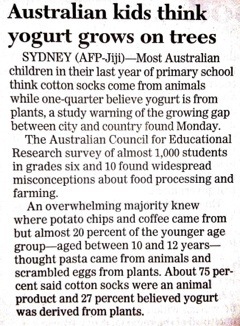 So I am not surprized to read that Australian children (I grew up there) think cotton sock are from animals and yogurt come from plants. The logic could be mixing up cotton (from plants) for wool (from animals). Perhaps the logic for yogurt too is that it is from plants because the flavours are mostly fruit (strawberry, mango, apple, etc) or plants (aloe, which is a popular flavour in Australia). Television, in a way, is a good window for information. The other source of information for me back then is books and public libraries. At least ithese were for me when I was a child in an age without the internet. Today’s children have no excuse for ignorance and laziness. The democracization of knowledge is one of the great achievements of our time now. But the ease of obtaining knowledge in this age of information superhighway is also perhaps a loss of the ability to find out things for oneself in a genuine form of discovery and intimate understanding. Today’s children perhaps therefore rely on packaged information as much as packaged food that is, what I call, our supermarket culture. But I think it is not only children who have trouble drawing logical conclusions about the world but also adults. Our world is complex. In this day and age learning to filter out the noise from the music is by no means easy. Nonetheless we must learn to filter it. 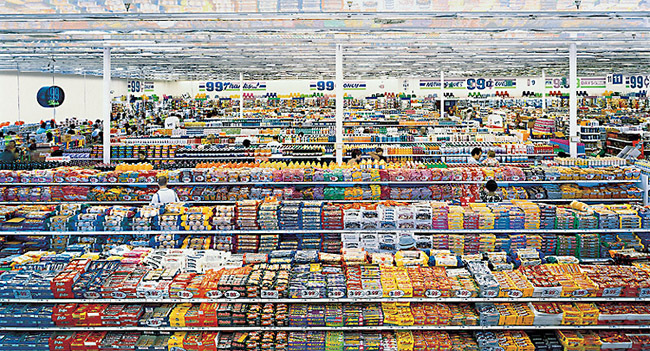 This entry was posted in sustainability and tagged australia, culture, food, gursky, knowledge, supermarket, unsustainability on 6 March 2012 by signature103. Hasn’t anyone figured out that the world’s economies only ever seem to work with bailouts. Something is very wrong here. This entry was posted in sustainability and tagged economics, economy, money, sustainable development, unsustainability on 29 November 2011 by signature103.